Midland RockHounds second baseman Corey Wimberly had just gone 4 for 5 with two RBIs in a 7-4 Midland victory in April 2009. But it wasn't just the players who helped Midland to victory, Wimberly told The Tulsa World. "We're a good hitting team," Wimberly told The World, "and the credit for that can go to our hitting coach (Webster Garrison) and our guys getting quality at-bats every night." Wimberly was speaking of a hitting coach not only with a decade of experience as a coach and as a manager, but 16 seasons in professional baseball as a player, and an all-too-brief stint in the major leagues. It was a career that began in 1983, taken by the Blue Jays in the second round of the draft. Early on in Garrison's career, his bat was cold. 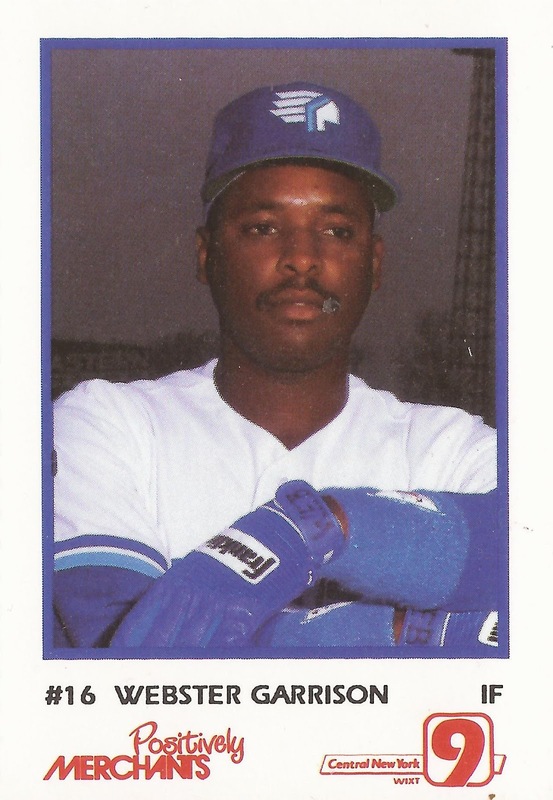 He hit .239 at single-A Florence in 1984 and just .203 at single-A Kinston in 1985. He didn't make AA Knoxville for an extended period until 1988, a promotion he earned when his bat heated up to a respectable .283 at Dunedin in 1987. That average was earned on nights like June 20, where he had three hits. He made AAA Syracuse in 1989 and returned in 1990. But his 1990 season was limited to just 37 games, his final games in the Blue Jays' system. Granted his free agency, Garrison signed with Oakland, the team that would eventually bring him to the majors, but not for another six seasons, with a stop in Colorado in between. Garrison stayed with the Oakland system through 1993, having his best year in his last. He hit .303 with AAA Tacoma. 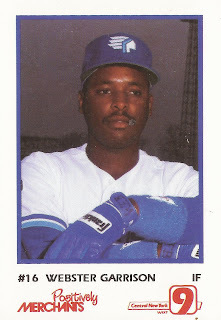 Granted free agency again, Garrison signed with the Rockies for 1994. But two productive seasons at AAA Colorado Springs, hitting .302 and .293. A Garrison July 7, 1994, three-run home run helped the Sky Sox to a 10-2 victory. But Garrison was rewarded with no call-ups. He signed back with Oakland for 1996. Starting back at AA Huntsville, Garrison hit .281 in 47 games, including a two-run home run May 23. Soon, Garrison was back at AAA, this time at Edmonton. Soon, he was in the major leagues. Garrison got the call-up Aug. 1. He was going to Oakland, making his debut that night against Milwaukee. It was a debut noted in the wire account, not for what Garrison did, he went 0-3, but for how long it took him to get there. He got there after 13 seasons and a total of 1,628 minor league games. In all, Garrison played in a total of five games for Oakland that year. In 10 plate appearances, Garrison got a walk and nothing else. He never returned to the majors and never got a major league hit. Garrison held on as a player at AAA and AA through 1999, before turning his sights on coaching and managing. His last year as a player was also his first year as a coach, serving both roles at Midland. He became a manager in 2001, earning Manager of the Year honors in the Midwest League in 2003. Garrison's been back at Midland since 2004, serving as manager and hitting coach at different points since. He also coached in the recent Texas League All-Star game. In 2018, Garrison served as manager of the single-A Beloit Snappers.